How do I add and assign scan jobs with Document Capture? You can view or change the default scan settings when you scan using the start button on your scanner. 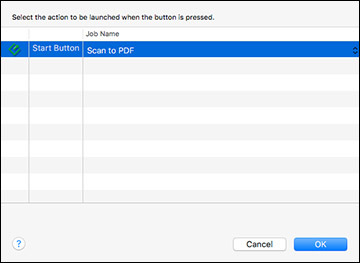 You do this by accessing the scan jobs in the Document Capture program. Note: If you installed the Epson ScanSmart software, pressing the start button on your scanner starts Epson ScanSmart instead. For instructions on scanning with Epson ScanSmart, see the help information in Epson ScanSmart or click here to access the Epson ScanSmart User's Guide. Note: If you did not install Epson ScanSmart, Document Capture Pro (Windows) and Document Capture (Mac) do not support scanning from the start button on your scanner over a wireless network (ES-500W/ES-500WR). Launch Epson Scan 2 before scanning from the start button on your scanner. Start Document Capture on a computer connected to the product. Click the Manage Job icon from the toolbar at the top of the window. You see a window showing the current scan job list. If you want to add a scan job, click Add or the + icon, enter a name for the new job, select settings as necessary, and click OK. You can now use the new scan job when you scan with Document Capture. If you want to assign a scan job to the start button, click the icon at the bottom of the window and click Event Settings. Select the job that you want to assign to the start button.